Over 140,000 people lost their lives on our roads last year, giving India the dubious distinction of having the highest number of road accident victims in the world. As our country continues to motorize exponentially, this problem will only grow—unless we make urgent and far-reaching changes to our road safety approach. Any road safety strategy will mean nothing if it neglects to consider the mobility and safety of the most vulnerable road user groups, that is pedestrians, cyclists and motorcyclists. In most major cities in India, these groups make up more than 75 percent of all road fatalities; pedestrians generally accounting for more than half that number. However, most of our road safety strategies are car-centric. Little attention is paid to the mobility needs of the vulnerable road users, putting them at risk as they attempt to negotiate their way through fast moving traffic. Designing sustainable principles into our transport and development policies will have a significant long-term impact on the road safety scenario in our country. Like Sweden’s Vision Zero policy, cities need to focus on the safety of vulnerable road users, such as pedestrians and cyclists. If roads are designed to be safe for the most vulnerable user, then it will be safe for all. The single most critical factor in road accidents is speed. Speed increases both the likelihood of a crash, and the severity when it occurs. Traffic calming measures, that is, designing to automatically control excessive speeding, will have a far greater impact on road safety than any other measure. In fact, the most effective way to control speed is through road design. In the context of shared road space, traffic calming measures would mean fewer crashes and fatalities for not only car users, but for pedestrians and other road users as well. Sweden’s Vision Zero designed city roads to dictate speed choice. They set up three – and only three – standardised speed zones across the entire country, of 30 kmph, 50 kmph and 70 kmph. The speed limits were decided first based on what is suitable in the local context, and then based on the given road’s function in the overall road hierarchy. Rather than relying merely on speed limit regulations, road designs were altered to induce motorists to drive at the design speed, such that a motorist is almost automatically aware of the stipulated speed without having to look for speed limit signs. In India, it is unrealistic to expect speed limit regulations to be effective, given the poor level of traffic compliance. 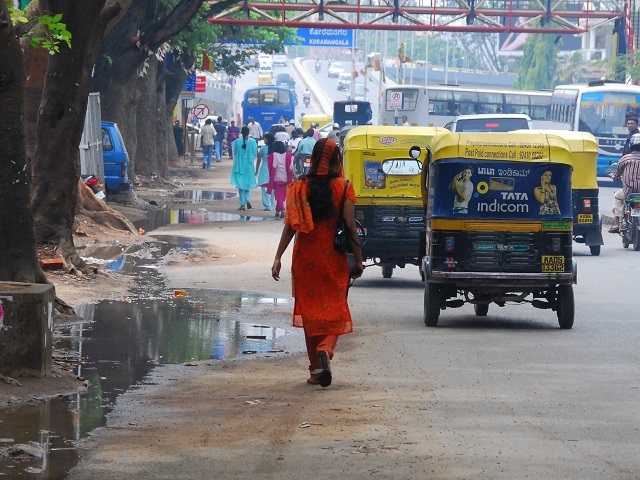 Road design in India follows outdated highway standards that have, in many cases, not been updated in decades. The generous lane width, wide road curvature, uninterrupted medians, and grade-separated intersections, allow vehicles to be driven at very high speeds. It is pointless to overdesign a road for a much higher speed, and then enforce a lower speed limit. This is both a waste of money, and a big contributor to the safety problem. For example, the Bandra-Worli sea-link in Mumbai, an 8-lane highway, is designed for speeds in excess of 100 kmph. However, in order to reduce the number of accidents, Mumbai Police have enforced a 50 kmph speed limit, and had rumble strips installed in order to slow down vehicles. Had the sea-link been initially designed for a 50 kmph speed limit, it would have saved a lot of resources. What design features can reduce speed? Mainly, reducing the number and width of lanes, providing tighter corner curbs at intersections, and introducing frequent median breaks, pedestrian crossings and speed humps. Chicanes can be inserted in high density areas of the city that mix different forms of transport. Chicanes are artificial features that create extra turns in the road to slow traffic for safety. Segregated lanes for non-motorized transport users, such as footpaths and cycle lanes, should also be built as part of a larger contiguous network. Contrary to popular belief, these measures do not aggravate traffic congestion, but rather help ease congestion by ensuring consistent travel speed, smoothening traffic flow, and preventing the build-up of traffic at intersections. In fact, designing roads for lower speeds increases road capacity, as faster moving vehicles require more road length per car in order to maintain adequate headway between vehicles. In a new report, Cities Safer by Design, WRI Ross Center for Sustainable Cities presents a guide that includes more than 30 specific urban design recommendations for urban planners and policymakers, emphasising both building and retrofitting urban environments to reduce the need for individual vehicle trips, as well as reducing vehicle speeds in areas where cars, pedestrians and cyclists mix. This guide will help authorities make the right design choices to reduce fatalities, improve quality of life, and make cities vibrant and prosperous. This article originally appeared on WRI-India.org.